Lasagna are a wide flat pasta shape considered as one of the oldest pasta type originated from Italy. This preparation generally prepared using minced meat (mutton/ lamb or beef) in tomato based gravy/sauces layered with pasta and cheese(Mozzarella/ Parmesan). Sometimes white sauce is also added to make it more creamy and rich. As i am preparing a vegetarian version i have added white sauce in this recipe. I made this dish as healthy as i can by adding assorted veggies, mushroom, soya granules and green leafy vegetables. As Italians use brinjal in their cooking i have added that as well. About the taste, at home we all loved the taste. We felt this vegetarian version was more tasty than the non-veg lasagna. The taste of assorted veggies gets different flavor in each bite. 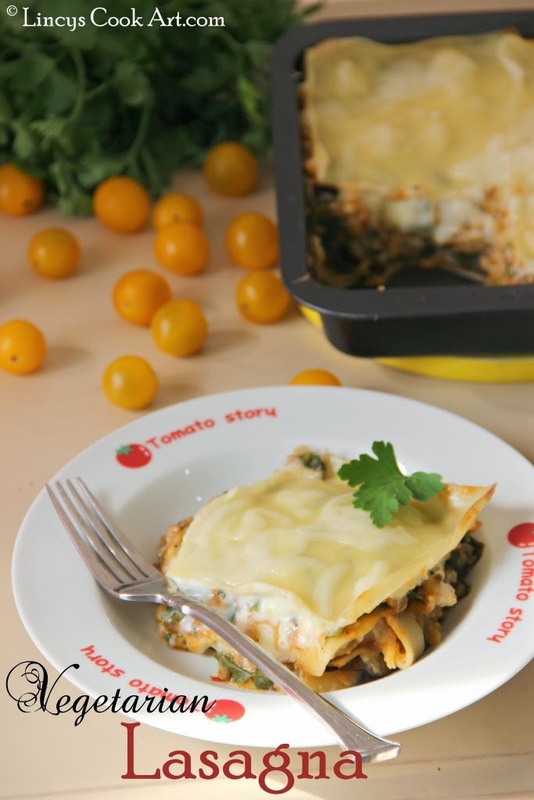 Soft egg plant, mildly crunchy bell peppers, meaty mushrooms and soya with the creamy white sauce and cheese, I have to say a great texture and taste combo Lasagna. Now add the egg plant and salt. Saute for a minute. Then add soya granules in hot water and squeeze to remove water from the granules; add and mix well; cook for a minute and add all purpose flour and allow to coat the veggies well. Add vegetable stock and allow to cook till the the stock is reduced to slightly thick but pouring stage. Add dried basil leaves and season with pepper and salt. Now mix the pasta sauce/ tomato puree with this veggie mixture; Set Aside. Prepare the White Sauce/ Bechamel Sauce. Set aside. In a baking tray arrange the pasta sheets then spread the prepared vegetable mixture. Then add the White sauce and spread well. Then sprinkle the mozzarella cheese on top. Cover with pasta sheet and repeat the process till you finish the mixture. I have prepared double layer using this quantity in 20x20 cm square baking tray. Cover the baking tray with aluminium foil and bake for 30 - 40 minutes. If you are using soya chunks after rinsing in hot water mince them slightly. Pasta sauce can be replaced by pureed tomato of equal quantity in this recipe. White sauce and Pasta sauce can be made earlier and used. If you want golden crust on top, add cheese on top of last layer of pasta sheet. Cook for 15 minutes covered then leave the tray uncovered for about 15 to 20 minutes while cooking. 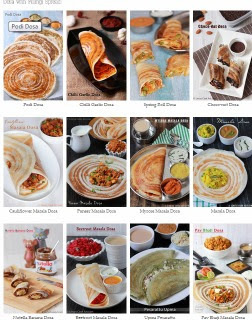 very well explained.. even a beginner who has never heard of this dish , can recreate following ur simple steps..
Wow ..these look perfect dear ..Love it dear !! Interesting and I love to try it. Inviting........ Looks super tasty !!! Those veggies and the scent of basil together? Yum and its something I should make for our meatless meals. The sheets are available over here, so buy, make and enjoy. Btw, am following you on blogger and liked your fb page. Appreciate the same and thanks so much. They look very much perfect. Lovely! Looks so yummy. I never thought of making veg lasagna.. Should try this now during lent..